SKNIS Photo: (L-R) Dr. Lois Parkes, Regional Project Manager, Prime Minister Dr. the Honourable Timothy Harris,Project Director Colleen Rossiter, who works at the Canada School of Public Service and Cabinet Secretary Josephine Huggins. To achieve this goal, the CLP is following a modular programme which includes Leadership Development Programme, Enabling Environment, Research, Continuous Learning and Development Network, Communities of Practice and Caribbean Centre of Leadership Excellence. Each module will be held in a different participating country. Dr. Parkes said that the CLP is geared at developing public sector leaders across 12 CARICOM countries and a decision was made to first start with persons who hold the post of Permanent Secretary. To date, three cohorts of persons have participated in the leadership development programme. These persons include permanent secretaries, heads of regional organisations and CEOs in the public sector. Level two, which targeted the forth cohort including senior leaders who are below the post of permanent secretaries, has also been completed. The fifth cohort will soon be completed. The sixth cohort consists of leaders in St. Kitts and Nevis. It will start on Monday May 30 and end on June 3. Four modules will be covered over the five days. Facilitators have been drawn from around the region including facilitators from the Management Institute for National Development in Jamaica and Cave Hill School of Business in Barbados. In addition, executive coaches employed by the CLP and cross cutting theme specialists will also facilitate the programme. The facilitators are also called action learning coaches and will be involved in helping the leaders to carry out what they have learned said the Regional Project Manager. 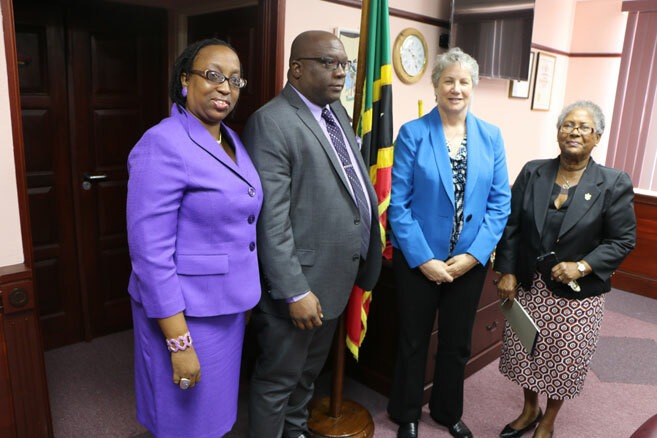 Dr. Parkes along with Project Director Colleen Rossiter, who works at the Canada School of Public Service, visited Prime Minister Dr. the Honourable Timothy Harris and Cabinet Secretary Josephine Huggins to discuss details of the project. The CLP’s executing agency is the Canada School of Public Service (CSPS) while the Regional Project Office (RPO) is hosted by The Cave Hill School of Business/The University of the West Indies (CHSB/UWI) in Barbados. Officially launched in 2013, the CLP is a seven-year project funded by the Department of Foreign Affairs and Trade and Development (DFATD) (formerly known as CIDA) to support the leadership and economic development training needs of regional and national public sectors in twelve (12) CARICOM countries. The countries participating in the project are Antigua & Barbuda, Barbados, Belize, Dominica, Grenada, Guyana, Jamaica, St. Lucia, St. Kitts & Nevis, St. Vincent & the Grenadines, Suriname and Trinidad & Tobago.